So Bry and I rode the Cromwell Park last night for a few hours before heading over to Vinyl for a little street session. 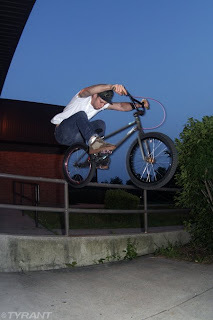 Bry has been scoping out this scary rail hop at the school for years and it almost went down last night! The gap involves some zig-zag maneuvering through 2 rails before accelerating up a short ramp and boosting across a 3.5" gap up and over 42" rail and dropping 5 feet on the other side. The rail hop isn't the hard part, it's the tight technical weave through the rails on the run up. Bry was tired from riding the park and I didn't want to see him eat sh!t so we decided we come back later in the week to tame the beast. Stay tuned...I'll be there with camera in hand when it goes down!